The TGI 81 Clip On Tuner is excellent value for money. 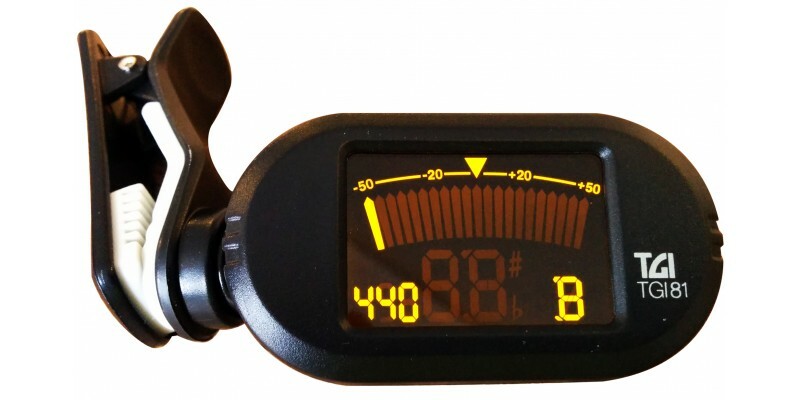 With a clear and bright display this chromatic guitar tuner is perfect for the stage, studio or home. This clip on tuner works through vibration. Simply clip the TGI81 onto the headstock of your guitar, bass, violin or Ukulele C. It works on a pivot system that can freely move to get your desired angle. Switch the TGI 81 Clip On Tuner with a small rubber button at the rear. The screen then lights up. When you play a note on on your instrument it will tell you if your are sharp or flat. You can then tune accordingly.